"Mama, step on the gas"
"Mama, step on the gas on the way there." That was the call from the backseat as I drove Julian, my 4 year old, to the emergency room. He burned himself in one of those kitchen moments I am always waiting for, especially with a kitchen that is not even considered large enough to be small by modern architectural standards. In addition to the size of my kitchen there is the energy and enthusiasm of my children, it is amazing this has never happened before. As I sat at the registration desk with him I wondered if it would sound like I was lying. How often do people come in with a preschooler who burns them self on a half sheet pan because they are trying to steal a roasted brussels sprout before dinner? Maybe I should have told them he was reaching for a warm cookie. Julian and I sat together in a mercifully oversized chair in the waiting room reading. My father gave the boys The 20th Century Children's Book Treasury several years ago and somehow I had the presence of mind to grab it as we left the house. I have always loved that gift as it makes it much easier to bring a library of bedtime books when on vacation. In this instance it turned out to be invaluable. Part of Julian's joy while reading it was getting to choose the stories I would read. Just a perfunctory no to the stories he was refusing and a voice filled with joy for the ones he wanted to hear. Perhaps it made the emergency room visit a little too nice as he came home and announced to his father, "I had fun at the emergency room." Now we both have visions of him becoming even more death defying in his actions. Although I have to admit I had fun with him as well. When we were finally ushered in to a room and seen by a Physician's Assistant I found out it was only a small second degree burn and we did not need to come in. They still bandaged it up before sending us on our way. When we returned home, both starving, I was relieved to see Julian still tearing in to a pile of roasted brussels sprouts. I feared he would hold a grudge against them. 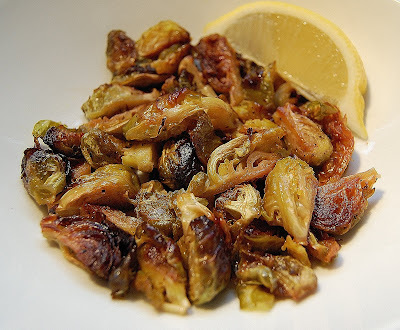 Now that it is brussels sprouts season I urge you to revisit this recipe/method, even if you have never liked brussels sprouts in the past. I know of at least 4 people who have been converted by this preparation. Place the brussels sprouts on a roasting pan and drizzle with olive oil and sprinkle on kosher salt and freshly grated pepper. Afterwards toss them around with your hands making sure that the sprouts are well covered in oil. roast in the oven, shaking the pan occasionally, until the sprouts are nice and caramelized (brown) over much of their surface area and tender but not mushy when pierced with a fork or knife. I am afraid I have no idea how long this takes, especially as I gave a range of temperatures. I just check them when I go to shake the pan. This time I cooked them for approximately 30 minutes on 400° with convection. I have also cooked them at 400° without convection and it took closer to 45 minutes. Friends recently told me they made them once with diced apples added in the last 5 minutes, I intend to try that variation soon. As a child we used to get green tomato pickles from Williams Chicken near my Grandmothers. They would be floating in a large plastic tub of brine and they were sour and delicious. My brother was mildly addicted to them. Even though I understand his obsession with them, I still do not fully understand the night he created, "Green tomato stuffed hamburgers". Let me just suggest you never attempt to make them and leave it at that. Although I have to admit the vegetable soup with the egg poached in it he made another time was worse, maybe it was the addition of the melted stinky cheese. Several years ago I consulted the Ball Blue Book and tried to make green tomato pickles. Some folks liked them, but for me it did not match my memory of pickled green tomatoes. This summer when I was making lacto fermented pickles I realized the pickled green tomatoes we all loved where lacto fermented, not vinegar, salt and water. The folks from Flack Family Farm told me to use the same procedure I would use for any vegetable. Then they thanked me for giving them an idea for using their green tomatoes. The good news is this method of pickling couldn't be easier, no boiling water bath canner, no hot brine. Plus lacto fermented foods are super foods, in modest quantities anyway. They improve vitamin absorption and correct the environment of your digestive system. The down side is after 3-4 days at room temperature they have to be stored in the fridge. The basic procedure comes from the Nourishing Traditions cookbook. Although there is no recipe for green tomato pickles in the book. It is better to make the pickles with homemade whey as they are lower in salt and it works more consistently. Whey is really simple to make using full fat yogurt that active yogurt cultures. The only downside to making it with whey is you have to plan ahead, and have yogurt in the house. Wash the tomatoes and remove their stems and place in the clean wide mouth jar to 1 inch below the rim. Add the garlic and hot pepper between the tomatoes and add the salt and whey, if using. Fill the jars with water to 1 inch below the rim and screw on the lids. Store at room temperature for 3-4 days (3 days when kept at 72°) before placing on the top shelf of your fridge. They can be eaten after the 3 - 4 days but are better after a month of storage. It's normal if the brine is fizzy or there is white foam floating on the top. If the pickles go bad the smell will be completely off and you won't want to eat them. As a full disclosure thing, the green tomatoes in the photo are not fermented yet. When done they will be more of an olive green color. I just wanted to post this while there were still green tomatoes for people to use. 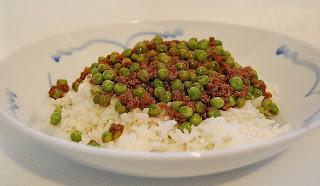 No matter what culinary feats I may accomplish, how intricate and subtly spiced dishes I may prepare I think my families favorite may be simple Chinese Hamburger with Peas. I am pretty sure this recipe will mark the first time my best friend from high school, Kira, makes anything from my blog. It is still a favorite of hers as well. For me this is basic comfort food. I have no idea what cookbook it was from because my father, in a move that still enrages me, allowed roommates to throw out my mothers complete set of Le Creuset, including a kitchen workhorse they no longer make, and all my mother's cookbooks. After my mother died my father began to make it, it was our weekly respite from take out food. We used to wing it, when making this for dinner, but I got tired of the sometimes lackluster renditions, so I tested and recorded the best version. This is truly a pantry staple/emergency dinner as you can cook the hamburger meat from a frozen block without a problem. Just throw the block into the pan and cook over medium high heat, flipping it every few minutes to scrape off the browned and defrosted meat. Not glamourous but really handy for getting dinner on the table without ordering take out. Tonight when making this Sebastian helped me, browning the meat, reading the recipe, measuring ingredients. Helping to brown the meat for this dish is one of my earliest memories in the kitchen. At dinner Julian talked about when he is in second grade and is old enough to help, "Even getting to brown the meat." I have made it with veggie ground beef and it is still good, if you were not a meat eater my guess is it would be stellar that way, for me there was something missing. Brown the ground beef in a large saute pan over medium high heat, breaking the meat up into bite sized pieces. (If the meat is frozen just flip it over every few minutes and scrape off the cooked layer). Once the meat is all broken up and is starting to brown add the garlic (if the meat is very fatty drain off the extra fat before adding the garlic). After all the meat is browned add the sherry, oyster sauce, ginger and both soy sauces. Cook while stirring until well combined. Add the frozen peas and then dissolve the cornstarch in the water and stir to blend well. Add the water cornstarch mixture and cook over high heat until the liquids boil and the sauce thickens a little from the cornstarch and the peas are heated through. Serve with white or brown rice. As a child the question of where I wanted my rice in relation to the Chinese Hamburger was very important. Eventually I got to the place where I wanted the Chinese hamburger on top of the rice. Sebastian has it on top now and Julian is just beginning to mix some of his portion together at the end of the meal. It is one of those parenting echoes that I enjoy, rather then the ones that prove my parents cursed me to raise a child who is just like I was. 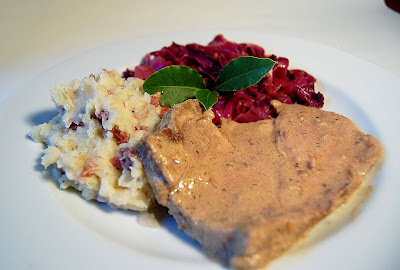 For my most recent adventures in the kitchen you will need to head over to Om-nom-nomnivore and my post on Pork Loin Braised in Milk. 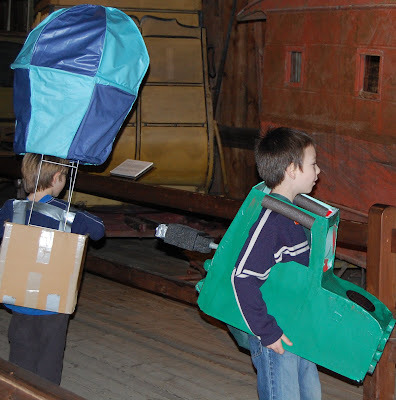 This is part of their week long salute to swine flu. Now that I have directed you to that post I can go back to sitting shiva for Gourmet magazine. Gourmet has been my go to magazine for many years now and I am deeply saddened to lose it. Without Gourmet I would never have begun my localvore focus that began for me with the article they ran by Bill Mckibben when he ate only locally produced items for 9 months. Time to go drown my sorrows in leftover pork. My friend Ann of Thibeaults Table is promoting her new gallery of beautiful handcrafted items from local artists with a giveaway. 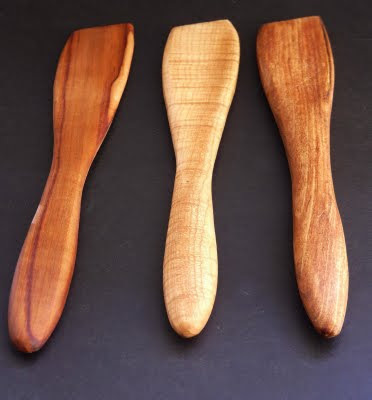 On her gallery Ann is showcasing artisan crafted cutting boards and spoons for purchase. The boards in particular are beautiful one of a kind pieces of art. They would make a fabulous hostess gift. 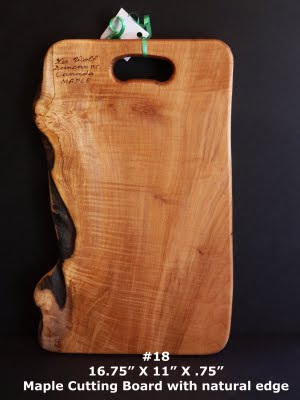 Imagine how delighted your host would be if instead of flowers, that will die, you brought a one of kind cutting board that could be used for generations.